On the way back to Edoras the Rohirrim met Aragorn, Gimli and Legolas. Éomer demanded their names and business. Fighting almost broke almost out between them, but Aragorn prevented this. He then told Éomer his true name and showed him his sword, Andúril. Éomer now listened to the story of their journey, and learned about the losses of Gandalf and Boromir. When Aragorn revealed that they had tracked the band of Orcs all the way from the Emyn Muil in the hope of rescuing the hobbits, Éomer was astonished and gave Aragorn the name 'Wingfoot', recognizing the difficulty of crossing so much terrain in so little time. He revealed that his men had destroyed the band of Orcs, and that it was fruitless to go searching for his friends. He instead urged Aragorn to return with him to Edoras to help the people of Rohan in their need, but Aragorn refused and insisted that he be able to continue his search for the hobbits. 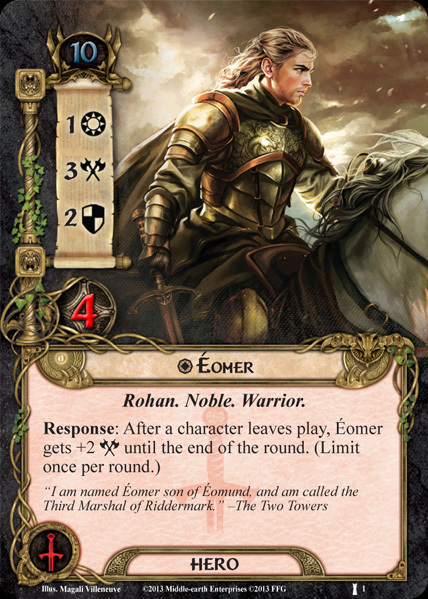 Although he was counteracting the law of Rohan by letting Aragorn go free, Éomer decided to trust him and he even lent him and his companions two horses, Hasufel and Arod, to help them in their search, but he asked them to prove his trust by bringing them back to Edoras when their search was over. On 5 March the company set out to Helm's Deep. While they rested in the night Pippin took the palantír of Orthanc from the sleeping Gandalf, looked in it and was confronted by Sauron. Knowing the peril Pippin was in Gandalf said farewell to the others and departed with Pippin towards Minas Tirith. The Three Hunters and the Rohirrim continued their journey towards Helm's Deep where they arrived on 6 March. Now Aragorn looked into the palantír and revealed himself to Sauron. Because of what he glimpsed in the palantír, he left the Rohirrim, and took the Paths of the Dead with the Grey Company. Éomer was afraid of never seeing him again, but Aragorn predicted that they would 'meet again, though all the hosts of Mordor should stand between.' before setting out. So the Rohirrim arrived on the battleground of the Pelennor Fields at dawn on 15 March. Éomer led the first Éored that should follow the king's banner in the centre. The Rohirrim were strong and filled with wrath and many enemies were slain. The Rohirrim went hither and thither at their will and so Éomer was only brought to Théoden when the king was already mortally wounded. Before his death Théoden hailed Éomer as King of the Mark and Éomer and those who stood by wept. When Éomer recognized Éowyn lying nearby a cold fury rose in him and without taking counsel or waiting for the approach of the men of the City he led his men across the field slaying all enemies in their path. As they charged he shouted out 'Death! Ride, ride to ruin and the world's ending!'. After the great victory Aragorn set up his camp on the Field of Cormallen in North Ithilien and Éomer took part in the celebrations there. Together with the other Captains of the West he returned to Minas Tirith and attended the coronation of Aragorn on 1 May. 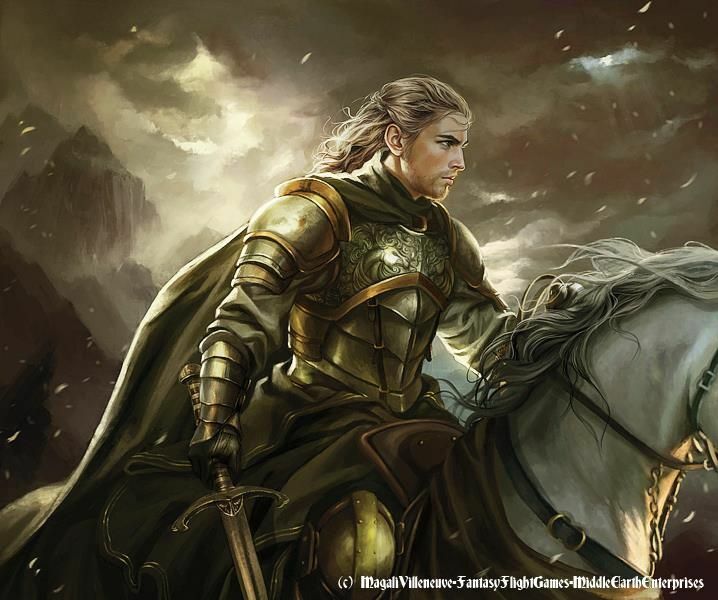 A week later he set out to Rohan with Éowyn for there was much to organize and to set in order. Before his departure he renewed the Oath of Eorl for Aragorn and both swore everlasting friendship between Rohan and Gondor. Éomer returned in July and brought Théoden's body back to Edoras. On 10 August there the funeral of Théoden took place and Éomer announced the betrothal of Éowyn to Faramir, the Steward of Gondor and Prince of Ithilien. When the feast was over, Éomer and Éowyn gave Merry the name Holdwine, 'loyal friend,' of the Mark, and the ancient Horn of the Mark, an heirloom of the House of Eorl. But though Sauron had perished the King of the West had many enemies to destroy before the White Tree could grow in peace. So Éomer often fulfilled the Oath of Eorl and went with King Elessar far into the East and South of Middle-earth. 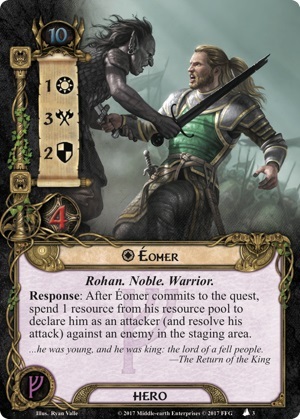 He was known as Éomer Éadig, or 'the Blessed', because during his reign Rohan recovered from the hurts of the War and became a rich and fruitful land again. In T.A. 3021 he wedded Princess Lothíriel, daughter of Prince Imrahil of Dol Amroth, whom he had met during his stay in Gondor and she bore him a son Elfwine the Fair. He was tall, strong and possessed of great passion and also was considered a valiant and splendid warrior and a discerning and decent man. Éomer became a great, wise and skilled warrior and rider. In a note written well after the initial publication of The Lord of the Rings, Tolkien gave Éomer's height as 'of like height with Aragorn', due to his grandmother Morwen Steelsheen, who was of Númenórean descent. Aragorn's height has been estimated at 6 feet, 6 inches. Éomer's sword was called Gúthwinë, which is Old English for 'battle-friend'. His name is likely derived from the Anglo-Saxon words eoh ('war-horse'), and mere, ('grand, excellent, famous'). He adopted the epithet Éadig during his kingship, which is an Old English word meaning 'happy, wealthy' and usually translated as 'blessed', used for saints in medieval literature.